FREDERICK, Md. — The number or used wholesale vehicles consigned at National Auto Auction Association auctions decreased about 2.4 percent in 2017 to 17.3 million units over the record of 17.7 million units in 2016, according to the NAAA 21st annual survey. While consignment dipped, the number of units sold rose in 2017 to 10 million units up from 9.8 million units in 2016. The value of the units sold was $105.6 billion, the report stated. The average price of units sold was up 3 percent in 2017 to $10,544, up from $10,233 in 2016. Dealer Consignment vehicles represented the largest number of units sold at 50.3%, Finance & Fleet (lease, fleet, repo) at 43.4%, followed by Manufacturer (factory) vehicles 5.5%, and 0.8% from (other) sources. Though dealer consignment represented the largest number of units sold at 50.3 percent, their sales rate was the lowest 50.6 percent. Finance and Fleet sales sold at 68 percent rate, while manufacturer vehicles old at a nearly 66 percent rate. The study concluded that the average NAAA auction member operates an 8-lane facility on 78 acres, employs 137 people with a payroll of $4.5 million, and contributes $14.5 thousand annually to charity. 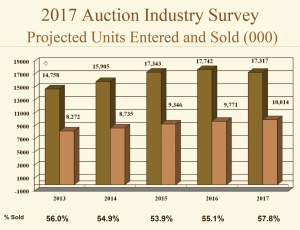 Conducted by Robert A. Casey Consulting of Burke, Va., for NAAA, the survey provides the most accurate picture available of the wholesale auto auction industry, with a 71% response rate representing 244 NAAA North American member auctions. The reported total vehicles entered and sold and the related gross values are projected to estimate the totals for all 342 NAAA member auctions.